DALLAS, Oct. 25, 2018 /PRNewswire/ — Carapelli Olive Oil, the world’s number one premium extra virgin olive oil brand, indulges culinary enthusiasts with rich, delectable recipes this Sunday, October 28 to recognize National Chocolate Day. 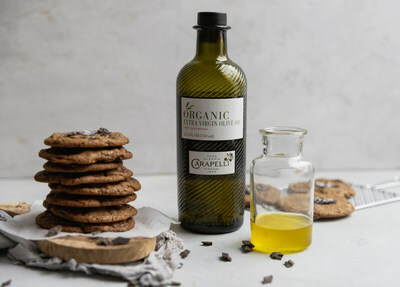 Partnering with blogger and baking enthusiast, Cosette Posko of Cosette’s Kitchen, Carapelli elevates a classic sweet treat, Chocolate Olive Oil Cookies, with a beautiful organic oil that is soft, balanced and fruity. Carapelli Organic Extra Virgin Olive Oil is also featured in a new on-trend recipe, Dark Chocolate Strawberry Ricotta Toast, perfect for a sweet celebration. Dedicated to high-quality craftsmanship with respect for nature, Carapelli offers two premium organic extra virgin varieties with exquisite flavor that enhance any dish, including luscious, chocolate delicacies. Organic Extra Virgin Olive Oil and Unfiltered Organic Extra Virgin Olive Oil feature olives from carefully selected groves, handled delicately with careful attention. The natural life cycles of the plants, trees, fruit and vegetables guide the olive oil creation. Carapelli’s mission is to actively care, nurture and prepare olive oils with quality and artistry. There is a concerted effort to minimize the human impact on the environment and ensure that the path from the grove to the bottle is as natural as possible. Crops are rotated so that resources in the field, or orchard are used efficiently. Chemical pesticides, synthetic fertilizers, antibiotics or genetically modified organisms (GMOs), either as a component of production or an end-product, are not used to make the organic varieties. A careful analysis of the soil and trees guarantees that there are no possible contaminants. Each bottle of Carapelli Organic Extra Virgin Olive Oil and Unfiltered Organic Extra Virgin Olive Oil also receives the USDA Organic Certification and Non-GMO Project Verified seal. Inspired by the superiority and benefits of baking with organic olive oil, blogger Cosette Posko prepared Chocolate Olive Oil Cookies featuring Carapelli Organic Extra Virgin Olive Oil to enjoy this National Chocolate Day. Decadent and indulgent with rich flavors, Carapelli offers a unique complexity to a tried-and-true recipe that chocolate lovers everywhere will celebrate. The Dark Chocolate Strawberry Ricotta Toast recipe, evokes the popular sweet-and-salty taste trend by combining the soft and fruity taste of Carapelli Organic Extra Virgin Olive Oil with ricotta cheese, toasted almonds, strawberries and decadent dark chocolate crumbles.